ES Chalon-Sur-Saone (ProA) added to their roster 33-year old Colombian international power forward Juan Palacios (206-108kg-85). He is a dual citizen owning also Spanish passport. 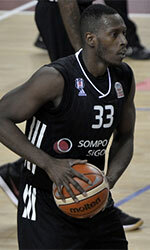 Palacios played last season at Besiktas in Turkish BSL league. He managed to play in three leagues last year. In 7 BSL games he recorded 5.1ppg, 1.3rpg, 1.1apg and 1.0spg. Palacios also played 4 games in Basketball Champions League where he averaged 7.0ppg, 4.5rpg, 2.3apg and 1.0bpg. The other team he played that season for was Neptunas in Lithuanian LKL. In 17 games he had very impressive stats: 15.2ppg, 6.8rpg, 3.5apg and 1.4spg. Palacios also played 9 games in Basketball Champions League where he was the best scorer with 13.3ppg and got 7.2rpg (#2 in the league), 2.2apg and 1.9spg. The list of the past achievements is quite long as among others he was voted Eurobasket.com All-Lithuanian LKL Import Player of the Year back in 2014. Palacios has been regularly called to Colombian Senior National Team since 2016. He is quite experienced player. Palacios' career allowed him to visit three different continents, while he played in six different countries. 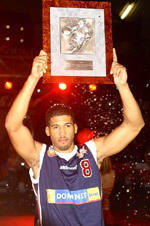 Palacios tasted the life as pro basketball player in Europe, Latin America and of course North America. He has played previously professionally in USA, Lithuania (Rytas), Spain (Gran Canaria, Vic and La Palma), France (JSF Nanterre) and Colombia (Guerreros).